As an Instructional Coach, one of the skills (or practices) I have refined and strengthened over the course of the last 4 years is my sense of reflection and its importance. The benefits include but, are not limited to; growth, confidence, more defined goal setting, an increase in vulnerability, and a stronger sense of team and collaboration. Reflection is something I know many of us do throughout our day, maybe without even knowing it but, when you have a reflective partner, the quality (or depth) at which you can reflect is very different. One of the ways an Instructional Coach can support teachers is through being a reflective partner. If you look up any kind of inquiry cycle, data team process, or decision scale...you will find reflection as part of those processes. Only through reflecting can you gain a true understanding of where you need to go. Because reflection allows us to see the steps and actions that have gotten us to the present in order to know what must be done (or redone or changed) in order to move us forward. Having an Instructional Coach as a reflective partner can give teachers new insight, ask themselves different questions, and may allow for teachers to see things in a different way. Through the training received in various types of coaching (especially Cognitive Coaching) we have learned so many different forms of questioning that leads to deeper understanding and deeper reflection. As a reflective partner your coach can have many roles: Listener, collaborator, co-planner, processing partner, motivator, role player, brainstormer, empathizer, and supporter. What this partnership looks like is based on the goals and/or needs of the teacher. The main goal in a reflective coaching cycle is that the teacher is able to learn, grow, and refine their practice, acknowledge all the aspects of their actions and progress, in order to move forward and be successful in what they have chosen to identify as their goals for themselves and their students. In the book Dare to Lead, author Brené Brown talks about the importance of resisting the shame so many leaders carry on their shoulders. As leaders we often feel the shame of not doing enough or being enough for the people we are attempting to lead. Being a leader is sometimes a very lonely job. One way that Brown encourages leaders to resist the shame of not being “enough” is by reaching out to others. By connecting with other leaders and colleagues we start to realize that we are not alone. Isolation cultivates shame. As leaders, we need to resist isolation and seek comfort in the imperfection of our lives. Get out of your classroom, get out of your office and go talk with other colleagues to help you realize you are not alone! Find your tribe! Those people who are willing to admit their imperfection are the people you need to be a part of your inner circle or as Brown calls them, your “square squad”. These are the people you are the most vulnerable with and the people that help you realize you are not alone. As a leader and a teacher you are more than enough for your colleagues and your students. 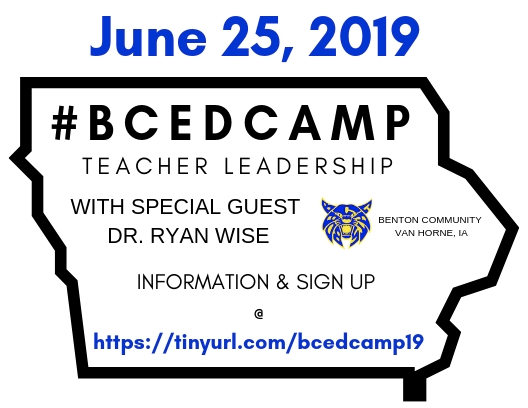 Benton Community School District will be hosting the 5th annual BCEdCamp on Tuesday, June 25 at the Benton Community High School. BCEdCamp was created by the Teacher Leadership Team as an opportunity to network with other leaders and to learn together. Over the years, the vision of this day has changed each year as the attendees develop the topics for discussion. The event has grown each year, and we hope to have a large group again this year. An EdCamp is a free learning opportunity that is open to all educators. EdCamps are participant-driven events; the schedule for the day’s topics is determined on that day by the participants. Participants can post a question for discussion or suggest a topic that they want to share about or learn about. EdCamps are not about planned presentations, but each center will have conversations about the topic. Teachers share information and experiences with each other. There is not necessarily an “expert” in the room; educators collaborate and solve problems together. Participants are free to choose the sessions that best fit their needs and can walk in and out of sessions as needed. Attending BCEdCamp is a great way to reflect on the past school year and to get energized for the upcoming year. BCEdCamp is open to all educators but does tend to have a focus on educational leadership. This is an opportunity for Principals, Teacher Leaders, and Instructional Coaches, and other leaders to learn from one another. Some topics that could be discussed are instructional frameworks, coaching models, ISASP, ESSA, classroom-level leaders, professional learning structures, personal development, blended learning, and collaboration structures. Remember, the schedule of topics is set that day, so if you have a burning question or something you are eager to share with others, this is a great opportunity. Whether you are a new Instructional Coach or a seasoned leader, BCEdCamp will be a chance to network and learn from each other. The Benton Teacher Leadership Team works hard to make this a fun day of learning. Snacks and lunch will be available on site. This blog post is intended to accompany a podcast episode. Check out the "Remember Why You Started" podcast episode at the page linked above. There are so many names that come to mind when I think about the people that helped guide me to be the leader I am today. I have been so fortunate in life to have a great tribe around me. I come from an amazing community that has always struck the perfect balance of finding ways to challenge me while always providing the necessary support. I went to a college that invested in me as a person and a future educator. I have the best friends that anyone could ask for. But above all, I come from an extraordinary family. The people that I am blessed enough to call family have influenced my every decision in life. In this entry I want to single out my mom and dad, these two individuals are hands-down the most influential people in helping me become the best version of myself. My dad is the hardest working person I have ever met. He commits 100% to whatever project he starts, whether it is his or someone else’s. He never operates from the mindset of just simply “getting things done”. When he commits, he gives you his best. Growing up he had one piece of advice on replay for my sisters and I, “If it is worth doing, it is worth doing right.”. That has stuck with me through life. As a leader, this mindset has helped me build trusting relationships with others. When I give you my word or join you on a journey, I am with you 100%. I will forever be grateful for my dad for instilling this mindset in me at a very young age. ​My mom is the one who encouraged me to chase my passions in life. She wore so many hats for me growing up, but the one she was most proud of was being my number 1 cheerleader. She never missed a game while I was in high school. She knew that I loved the sport of basketball and told me that I was going to coach it someday because I was fueled by working with kids. So, low and behold, when I started coaching for Benton, my mom was, again, my loud and proud cheerleader in the bleachers for all home games! This summer she told me she was so proud of me because I was doing exactly what I always wanted to do in life...teach at Benton Community, create opportunities for other kids like my teachers did for me, and raise my boys to be involved in the community. If you are passionate about what you do, you are charged by something more powerful than money. Your jolt comes from the heart. My mom was passionate about finding what makes me tick and supporting that. I hope that I can find and support whatever makes others tick and support them through their journey. In the first year of teacher leadership, instructional coaching was a job that I knew very little about as a classroom teacher. I had never been coached instructionally and I wasn’t exactly sure what this could or should look like. When I started to research and read about the vision for instructional coaching, I soon realized that I did, indeed, have an instructional coach. Her name was Sandi Gibney. ​Sandi was my teaching partner for 17 years and was one of the great educators that have influenced me as a teacher. Although our personalities were very different, our common belief in what good teaching and learning should be was the thread that always brought us together. As I think back to the many coaching sessions that Sandi and I had, it often happened over a bag of popcorn, a morning chat, or a hallway discussion between classes. During these times, I remember Sandi being one of the best listeners I have ever experienced. Sandi was so intentional about listening that she never multi-tasked. She would always stop whatever she was doing when I would come in the room and give me her full attention. She would ask questions to clarify her understanding and give me time to reflect on what I just said. It was through this listening that she often guided me to my next steps without once telling me what she thought I should do. She was a master instructional coach. When I moved into the role of instructional coach, I found myself channeling my inner Sandi. Listening without multi-tasking was so difficult. Asking and not telling was a challenge for me. Although these are still things I work at during conversations, I remember the way it felt to be coached this way. Sandi nurtured the young educator that I was and helped mold me into the teacher I wanted to become. She was my teaching partner, my role model, and my friend. I feel so lucky to have had her in my life and I can only hope that I can be half this person for someone else. I have had so many influences in my life, that have contributed to the type of leader, strengthened my leadership qualities, and enabled me to set goals as a leader...that it’s hard to narrow this to just one person. It helps me to think of the qualities I feel a leader should have and look at who contributed most to the qualities I have, am growing, or hope to have as a leader. A few of the qualities that come to mind are; confidence in my abilities, reflective, work effort, problem solving, forward thinking, flexible, ability to work in a team, perspective, and independent. I feel like a leader should be a go getter who can manage many things (organized) and be a solution finder. I also feel like a leader should think first to find answers rather than always look for others to “help” them. When I look over this list the first person that comes to mind is my father. While we did not always see eye-to-eye as I grew up (I will be honest, he was/is a very stubborn and sometimes scary man) I respected him, his opinion, and did what I needed to do...even when I didn’t like it. My father taught me about the value of hard work, figuring things out myself, BEING myself, and to “stop and think”. My father also taught me how to speak my truth...and how NOT to speak my truth. When I look over the characteristics I listed and the things others have done to build me as a leader (things my father did not) do for me, the words reflective, forward thinking, working as a team, and perspective stand out. My father was VERY independent and I am not sure I ever even heard him say the word “team”. One of the most important qualities a leader can have (in my opinion) is a reflective nature and that can sometimes mean looking at yourself for all that your are...even when it’s something that needs “refining”. After my father, there are so many various people who have instilled other leadership qualities in me. From students to friends, to teachers and principals, and ultimately the leadership team I have a part of for the last 4 years. When I think about how these people, and what they gave me, influences my coaching practice...the better question is, “How do they not?” I set goals based on the qualities I feel I need to work on, look to my peers for guidance on what I may not see and when I need a partner in reflection (a different perspective). Their influence impacts the effort I put into my work because I would want them to be proud and many of them have left their voice in my head...which means I carry what I hear them say with me as I make decisions, have other conversations, or with what I do in my practice. My hope is that the time I have spent in this leadership position has allowed me to pass this influence onto others and impact them as leaders in their lives. In October, the Iowa Department of Education released the Iowa Digital Learning Plan. This plan focuses on digital learning as it relates to five key components: Leadership, Teaching, Learning, Assessment, and Infrastructure. At Benton Community, we gathered a team of teachers o focus on this work. At the beginning of the school year, teachers, students, and families took a survey around digital learning. The BC Digital Learning Team came together and spent most of their first meeting and part of their second meeting really digging into the survey results. The survey data helped the team see where Benton Community needed to celebrate and where Benton Community needed to grow. Access to devices and high speed internet were definite areas of celebration. When looking at the results for places to grow, the survey pointed the team in the direction of work on the 4Cs: communication, collaboration, critical thinking, and creativity. The team had continued conversation about technology and its purpose. No one wanted to use technology for the sake of using technology. This led the group to more discussion around what “digital learning” really means. The state has developed an Iowa Digital Learning Plan that was rolled out this fall. In this video, Dr. Wise, shares information about the development of the plan including the stakeholders involved in creating the plan. He also makes connections to Iowa’s Future Ready Iowa goals. The Benton Community Digital Learning Plan is modeled after the state plan. All of the key components of the state plan have been included and connected to the spokes of the Bobcat Wheel. 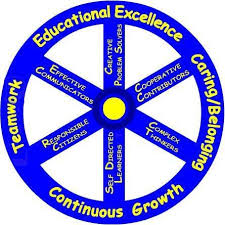 The Benton Community Digital Learning Plan is broken down by the spokes of the Bobcat Wheel. Again, the BC Digital Learning Team did not want to talk about using technology only to use more technology. The conversation really centered around the idea that technology needs to leverage or support what is happening in classrooms, not replace it. Also, the work of the team did not focus on devices, types of devices, etc. Instead of getting into a device conversation, the team really focused on how technology fits into what teaching and learning needs to look like across Benton Community. Each spoke of the Bobcat Wheel is featured in the plan, including a definition that describes each spoke’s focus area and additional information on how students and teachers can use digital tools to grow in the skill area. Working from a common definition helped guide how students and teachers can use digital tools to support the spoke or skill being addressed. Both the Iowa Digital Learning Plan and Benton Community Digital Learning Plan contain examples of digital learning. Benton Community is included in the Iowa Digital Learning Plan under the Leadership section. The story in the Iowa DLP focuses on the #BCEdCamp hosted each summer. 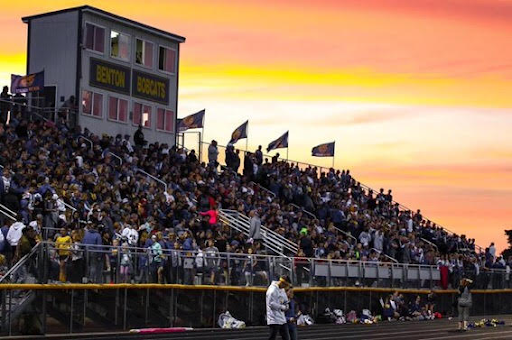 The Benton Digital Learning Plan includes local stories of how our teachers are promoting the skills addressed in the spokes of the Bobcat Wheel using digital learning tools. There are a variety of stories included in the plan. Each Bobcat Story has a link to additional information as well as additional resources. The BC Digital Learning Team recognizes that these are just a few examples, and more stories will be added over time. After hearing about the Benton Community Digital Learning Plan, teachers engaged in a morning full of opportunities and choice tied to digital learning and the spokes of the Bobcat Wheel. Session information and resources can be found below. In the world of coaching sports, there is not a coach around that doesn't use video to analyze their team's play. From basketball to soccer, coaches find people to video their competitions to help them improve. Coaches celebrate the successes, analyze their weaknesses, and even chart statistics to help their team grow. Why does this change when coaches switch from coaching sports to coaching teachers? This blog post, will touch on why Benton Community Instructional Coaches use video to improve coaching practices with teachers. Video can be an essential tool to help instructional coaches reflect and improve their craft. Although there is not a coach on our team that enjoys watching themselves on video, we all know how important this experience can be to help us grow as coaches. We believe video impacts our team in a positive way. One reason we use video is to help build a collective vision of a coaching cycle. As a team, we talk about coaching cycles all the time, but over the years I know that each coach on our team often wonders if what they are doing with teachers really constitutes as a coaching cycle. Is this what it is supposed to look like when I coach? By using video, we can share our vision and push ourselves as coaches to define a coaching cycle. Video is the springboard to the conversation that creates a "one voice" for our team when it comes to coaching. By taking time to watch our teammates coach, we develop a clearer vision of where we want to go individually and as a team. Another reason why I believe video to be an important tool is because coaches need to watch themselves coach. When you are in the middle of coaching, it can be challenge to consider what do or say. Why am I moving my hands so much when I talk? Does my face really look like that when I am listening? These are all important facets of working with others that need to be addressed and video doesn't lie. It is the mirror needed to deepen reflection. Reflection is another reason video impacts our team in a positive way. By using video, our team can reflect together on planning for a coaching cycle, coaching stems and questions used during the conversation, and possible next steps for the coach after a meeting with a teacher. With video, we can stop, start, and replay conversations that happen within the cycle. We are able to discuss celebrations and address missed opportunities. Reflecting together with your team requires vulnerability, but builds trust and a growth mindset for everyone. When we step outside our comfort zone, we create an opportunity to grow and learn. Teamwork is evident at Benton Community each day. The volleyball team jumps, sets, and spikes the ball to score a point. A huddle of football helmets whisper plays to out maneuver the opposing team. Elementary students organize elaborate games at recess. Band students march together to create a dazzling display of music and motion. All of these examples take place amongst our students. Each example highlights how our students work together; however, it may not be as noticeable how many people work together to create a positive learning environment in our buildings. Adults collaborate and work together each day, but we may not always view our group as a team. Yet, that is exactly what we are. A team working together to create positive experiences and maximize the learning potential for all students. One team that teachers may be a part of is their building team. Each school building in our district is distinct. A few district employees have the advantage of working in each of the buildings in our district; those who travel to different buildings will find that no building is exactly the same. Each staff group is their own team. Within each building, there are a number of data teams. These teams, either grade specific or content specific, work to evaluate student data and brainstorm ways to meet the needs of each student. These building level teams work together to problem solve and build relationships with everyone in their building. Each building group works together to form the district team. As a district, teachers work together to learn and create positive learning environments for all students. There are a few times throughout the year when the public can see all of the teachers and students in one place; Homecoming and Veteran’s Day are the most visible. However, all of the teachers in the district meet to learn collaboratively at several points throughout the year. These days allow staff to work toward district goals while learning from each other. Parents and teachers make up one of the most important teams in students’ lives. When parents and teachers communicate, it has a positive effect on student achievement. Parents and teachers can work together as a team to create the best possible learning environment for students. There are several ways teachers communicate home to let parents know what is happening in the classroom. Some teachers have websites, or apps that communicate home to parents such as Seesaw or Remind. Parents can email parents or set up time to talk about their child. Sharing what is happening at home and in the classroom helps teachers and parents to work together to create a shared vision of student learning. So just as the show choir members line up in anticipation to take the stage or the stars of the musical wait anxiously in the wings for the curtain to rise, Benton’s teachers prepare and work for each day to provide the best experience possible for our Bobcat community of learners. What does “continuous growth” actually mean? To some it may mean taking a class to learn something new, observing someone else at their trade in order to gain new ideas or insight, or even thinking about something in a different way based on reflective conversation. To others, it could be refining a skill they have already acquired or practicing to get faster or more efficient. Maybe to you it means these things or even something more. 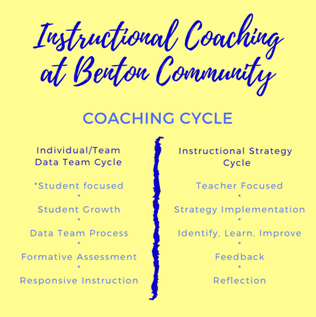 Coaching cycles are one way that teachers at Benton Community model continuous growth. Our coaching cycles at Benton Community are framed around the needs of our teachers and students. This means that a teacher can choose to use a coach for instructional supports or engage in a cycle driven more by student data or needs. Teachers may choose to choose work in either an individual or team cycle when engaging in this process. Teachers receiving instructional supports from a coach may determine this based on a goal they have set for either themselves or their students. As coaches, this may look very different based on teacher or student need, timeliness, school or district goals, or an area the teacher would like to improve upon or refine. A student-centered coaching cycle means just that. The data, goals, action steps, instruction, and assessments are centered on the students. Whether this happens with an individual teacher or with a team, student data and evidence of student growth are at the core of all decision-making in this framework. When a teacher is looking for support around strategy implementation, feedback on their practice, or working with a reflective partner, he/she would be taking part in a teacher focused cycle. The goal setting, action steps, and meeting design would be centered on an “Identify. Learn. Improve” structure to allow the teacher to refine and grow in their desired area. Coaching cycles can also look different depending on both the coach and the teacher. Just like teachers in the classroom, coaches bring their individual personalities and passions when working with teachers . 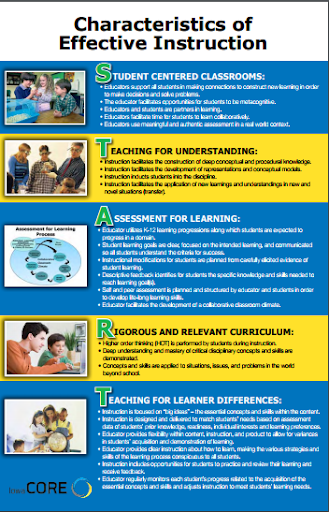 They must differentiate their instruction and practices based on the needs of the teachers and students they’re serving Coaches have built a framework for our practice around a variety of models. This means we are able to meet the needs of our teachers using multiple methods and tools, just like they do when teaching students. Our core values are beliefs our staff and students strive to meet daily. Last week’s blog was focused on the core value of Caring and Belonging. This week we are going to look at what Educational Excellence looks like at Benton Community Schools and how this ties to our district goal. Our district goal is for 100% of students to make one year’s growth based on state and district assessments in reading comprehension. 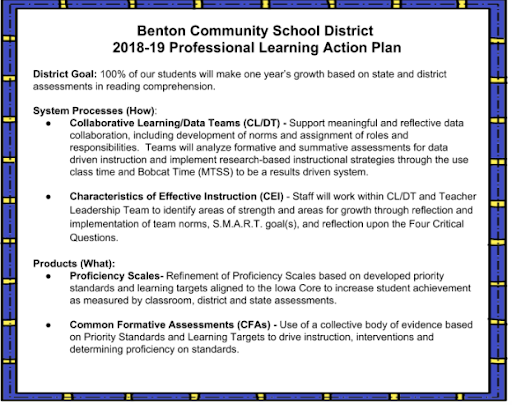 In order to attain this goal, Benton has identified an instructional framework, utilizes a data team process, and makes collaborative learning a priority. Benton has adopted the Characteristics of Effective Instruction (START model) as our instructional framework. We see this framework as a model for what great teaching should look like in all classrooms in our district. We strive to center our instruction, data teams, and collaboration around this model in order to keep students as our primary focus. Last year, our coaches and administrators had the opportunity to attend the Center for Educational Leadership (CEL) Training at Grant Wood AEA focused around providing meaningful feedback. This training led our administration and coaches to have goal-based conversations with all full-time teaching staff. Triad meetings may have looked different in each building, but they focused around the teachers choosing a goal. These triad conversations also allowed us to narrow our goals in order to create personalized Individual Professional Development Plans to fit the needs of each teacher. 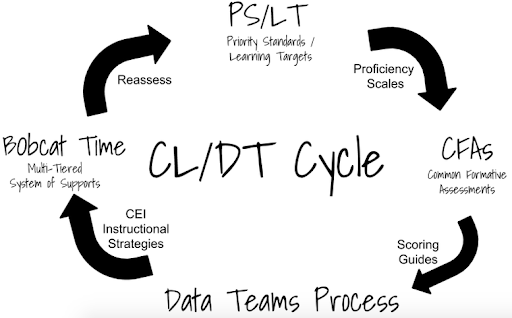 Another way Benton strives for Educational Excellence is through our data team cycles and collaborative learning time. Benton has made collaboration and teamwork a priority, and it has been a movement that has changed the way we do business! We all believe that collaboration is critical to the way we serve our students. Through the data team process, teams are using common formative assessments, charting data, analyzing student work, and monitoring student and teacher behaviors to offer the best learning experiences for all students. ​We continue to build knowledge in the data team process and refine this process in order to grow as educators and teammates. Through professional development, we have taken time to learn how to be more efficient, use research-based strategies, and think through the lens of OUR students. We continue to strengthen the data team process, while building the capacity of collective efficacy within teams. Of course, all of this intentionality is so we can provide the best possible educational experience for our students at BC. What is Benton Community’s unfair advantage? The answer seems simple, but it really isn’t. Benton Community’s unfair advantage is that it truly is A Place to Belong. We are a school district spanning across 330 square miles, 7 communities, and 3 counties. And even though it would be easy for us to be divided, we continue to pull our communities together to form one district, one community, one family. ​Our mission statement is depicted as a wheel. This is what we expect from our students, our families, our staff, and our community. One of the core values on the Benton Wheel is Caring/Belonging. It is something that is embedded in everything we do, everything we produce, and how we act. This past week you could have witnessed this great community at its finest. Homecoming is such a special time of year for all Bobcats, past and present. It is a time to celebrate, remember, connect, and relish in the amount of pride within this community. Our week started with dress-up days that coordinate with the homecoming theme. This year’s theme was “Dressing Up Homecoming 2018.” You could have seen preschoolers dressed as cowboys and seniors dressed in full luau gear. Everyone was invited to participate! The highlight of the week came on Friday when the entire district was transported, in their blue and gold gear, to the HS/MS for the annual parade and pep rally. Community members joined in on the fun and could be found right along side of the student body chanting B-O-B-C-A-T-S as the band kicked off the parade. The parking lot was full and so were our hearts. After the parade everyone filed into the gymnasium for the pep rally. The cheerleaders burst through a banner while the band erupted into a hearty rendition of “The Benton Fight Song.” The elementary kids rumbled their feet, and the MCs announced the entertainment line-up. First out of the shoot this year was the staff dance. This year the staff dance was structured as a Fortnite Battle Royale. This challenged each attendance center to give their best attempts at a handful of the popular video game inspired dance moves. It was awesome to look up and see kids K-12 doing the dances in the stands while the staff were rocking it on the floor. It is always amazing to see adults being willing to put 100% into activities to excite our kids. The pep rally continued with Kiss the Pig where Ms. Brown got the opportunity to do just that...kiss the pig. This is an annual fundraiser for the FFA (Future Farmers of America). This year’s funds were donated to the Crawford family to help with Myra’s battle against leukemia, which is a great example of Bobcats rallying around their own. Before the elementary buildings needed to head back to their attendance centers, the cheerleaders led the “GO BIG BLUE” competition. They invited each class to stand up and yell “GO BIG BLUE” to determine who earns bragging rights for being the loudest grade. The pep rally ended with an open invitation for the kids, staff, and community to come to the football game later that night. The pep rally must have done its job because Bobcat Stadium was packed Friday night with Bobcats both young and old. Thank you Student Council for your hours of planning and preparation for this year’s homecoming festivities. Benton Community is truly a place to belong because our unfair advantage is we are one big family.